Do you have a friend that can’t stop talking about his Nexus phone? Well, there’s a lot to like about the clean, bloatware-free approach of stock Android. But if we look beyond the nerds who care about all this stuff, for most people stock Android isn’t the holy grail when they’re buying a smartphone. In fact, if you were to take a peek at some of the customised versions of Google’s open-source operating system, there are some very interesting features that may make stock Android appear inadequate. So ignoring the sometimes gaudy, sometimes gimmicky aspects of these custom UIs, we pick some genuinely usable features found on Android phones made by popular manufacturers. Since Android 5.0 Lollipop, we’ve had access to multi-user mode on Android. Coolpad phones that run a custom Android skin dubbed Cool UI makes an interesting use of this feature — with Fingerprint User Binding. Say, somebody other than you uses your phone in the house. You can create a user account for that person and bind their fingerprint from Settings, and bind yours to the primary (admin) profile. 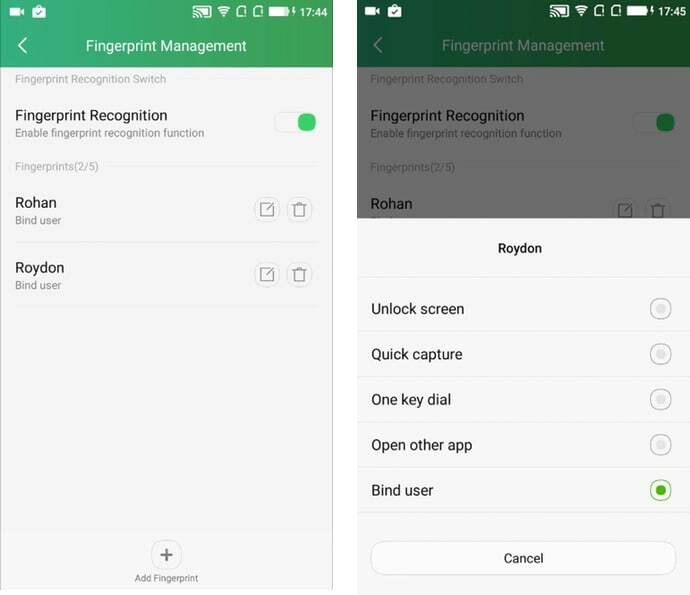 Now, when you unlock the phone with your finger, the phone shows all your apps, data and settings. If the other person unlocks the phone with their finger, a completely new user profile opens. This creates an extremely frictionless way for other people to use your phone, without having to worry about others accessing your data. It’s no different than the multiple accounts our computers have, with the convenience of easily switching these user profiles using the appropriate fingerprint. The fingerprint scanner on LeEco phones isn’t just useful for unlocking the phone or apps, you can use it as a shutter button for the camera too. For example, you can click photos by simply tapping on the fingerprint scanner to take a shot. This feature is also available on some other makers of custom Android interfaces. Apple iPhone users may find themselves familiar with Control Center, that’s available on phones made by Gionee and Lenovo. A swipe from the bottom reveals quick toggles for commonly used settings. Only thing is, unlike iPhones, you have to be careful of not hitting the menu buttons at the bottom accidentally. OnePlus 3 runs Oxygen OS, which although looks like stock Android in appearance, actually has some interesting add-ons. For one, you can customize the actions on the two soft keys on either sides of the fingerprint scanner. Or, if you don’t like using them, you can switch to on-screen buttons altogether. Samsung TouchWiz often receives hated for being gaudy and bloated. But hey, it’s got some useful tricks up their sleeves. For one, you can choose your most frequently used settings to be shown at the top of the Settings screen. So things like Battery, or Cellular Networks, that are Settings many of us access frequently, are visible top and centre. Next, whenever a call gets disconnected, there are convenient shortcuts to reconnect the call or leave a text message. This screen appears for a couple of seconds, giving you enough time to perform these typical actions. Xiaomi, a company known for their highly customised version of Android called MIUI, has many of the features mentioned in this writeup. But here are two we’d like to highlight — the first being built-in call recording. A great feature for journalists or any person actually, you can record calls by simply tapping the button on the call screen. Next, there’s one-handed mode, which shrinks the UI on big-screened phones down to a smaller size, so you can use the phone easier with one hand. So on a phone with a screen size of 5 inches or bigger, you can simulate the UI to fit into the dimensions of a 4 inch or 4.5 inch screen. And invoking this mode is easy too, by simply swiping from the back to home soft keys. Lenovo’s U-Touch lets you do cool stuff like customise gestures for the fingerprint scanner. For example, swipe left or right on it to multitask between apps. Or you can long press the home button to summon the notification drawer instead of pulling it down from the top of the screen. The new Honor phones have a fingerprint scanner that’s also a button. Dubbed ‘Smart Key’, you can customise it to perform one of the many actions offered; like turning on the flashlight. Motorola has had some very easy-to-use gestures since their first Moto X in 2011, and now almost every Moto device has them. Out of these — the double-twist to launch the camera or chop-twice to turn on the flashlight are our favourite. We also like how you can wave over the screen to see the most recent notifications. If you take a lot of screenshots, Oppo phones have a three finger pull-down gesture to capture a screenshot, instead of pressing down two buttons to take one. Also, the Panorama Selfie feature lets you capture a wider photograph from the front-camera; this can be useful when taking those Groupfies. Lastly, HTC phones for long have let you sort apps in the app drawer either by alphabetical order, most recently used or a custom app arrangement, similar to iOS. This flexibility is great for people to pick their style of app listings in the app drawer on their phone.